Sri Satya Sai Baba the self proclaimed bhagavan (God) from India was born on November 23rd, 1926 in a village Puttaparthi in Andhra Pradesh. His father is Peda Venkama Raju and mother Iswaramba. 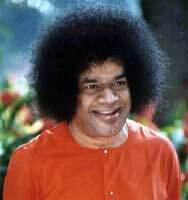 Earlier called Sathyanarayana Raju he later became Satya Sai Baba. The word 'Sathya' means truth, 'Sai' means mother and 'Baba' means father. Even from a young age he was different from his fellow mates. He used to lead his school mates in devotional songs and be their 'guru'. In 1940, when Satya was 13, a change came over him. He went into a deep state of Samadhi (trance) and had to leave High School. He began to perform miracles like manifesting things out of thin air and show powers of tracing lost property, reading others thoughts and so on. So people began to have faith in him. Soon afterwards, Satya Sai Baba announcing that he was reincarnation of the late holy man Shirdi Sai Baba, abandoned his family and set himself for what he believed in, the uplift of mankind - regardless of race, belief or background - without interruption or any kind of leisure. His followers grew in number and he established Prashanti Nilayam (abode of Eternal peace), an ashram where people could seek his guidance. Satya Sai Babha now has more than 6000 spiritual service centres around the world dedicated to the study and practical application of the teachings of Sathya Sai Baba which strongly emphasizes on service to community. His charitable work include providing free education in the colleges he has established, providing free medical care in the super specialty hospital near his ashram and also in other hospitals and clinics. The members of the service centers are involved in feeding the hungry, visiting hospitals, working with needy children and caring for the aged. As an educator he has inspired the development of a humanistic and spiritual educational programme (Education in Human Values) which has been accepted as a curriculum in elementary schools in India. Eighty-five-year-old Sathya Sai Baba died on 24th April, 2011 after a prolonged illness, plunging millions of his followers across the world into gloom.